In 1886, a mysterious travelling circus becomes an international sensation. Open only at night, constructed entirely in black and white, Le Cirque des Reves delights all who wander its circular paths and warm themselves at its bonfire. There are two types of feelings that I experience when I am read a really good book. The first is an adrenaline rush coupled with the inability to put down the book because I have to discover what is on the next page and I desperately want to find out how it all ends NOW. The second is the languid bliss of never wanting the book to end because I am utterly enjoying the ride along the way. 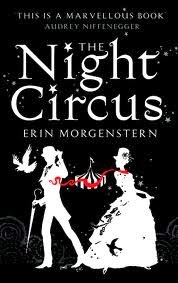 The Night Circus by Erin Morgenstern is one of the rare cases where I enjoyed both of these feelings as I read it for the first time. I think the first thing that drew me in is the description. Despite being black and white on the outside, Le Cirque des Reves is a sparkling shower of colours on the inside and Morgenstern paints it beautifully for the reader. I'm not a big fan of the circus (in fact, I don't think I have ever been to one), but the colours and the food and the magic in it all, really just made me happy as I was reading the book. However, I can see how the sheer volume of description may turn some readers off. The book can be confusing at times, with alternating chapters set in different years. So much so that I used a piece of paper as my bookmark and ended up writing down roughly the age of the characters at each particular year just so I could keep track! But eventually, the years begin to form a rough timeline and everything coalesced together. While no one can tag this book as action-packed, right from the beginning, you can't help but feel an impending march towards some sort of inevitable conclusion. Despite the shine on the surface, something is lurking underneath the surface, making you doubt the perfection that you see. I was satisfied with the pace of the story, even though it is probably a lot slower than books that I normally read. However, I couldn't give this book a full 5 stars. The ending left me with a somewhat unsatisfied feeling. Maybe it was Morgenstern's way of leaving the readers wanting more, but I just felt like the intricate delicate plot that she had constructed just didn't have the magical completion that it deserved. Like the title, the circus stands front and centre throughout this book, with the description, the characters and the plot all secondary aspects. However, this book is beautifully written and delicately put together that I really did enjoy the journey through it. The ending, however, lacked the magic that I felt throughout the book and I was left somewhat unsatisfied. All in all, this is a really good book and probably something that fantasy readers who enjoy. Great review, this is next up on my tbr list and I can't wait to read it! I loved this book. I read it in a single day and that rarely happens!